The Cushing Trader: The Cushing Trader sells unique products designed and assembled by our students including jewelry, framed art work, pottery, silk-screened clothing, cards and more! The varied offerings are perfect for that hard-to-buy-for friend, the couple that just purchased a new home, or a surprise bracelet for Mom. Every piece selected for sale at the trader is of fine quality and craftsmanship. Proceeds from all sales directly benefit the students and programs at Cushing Centers. Why shop elsewhere? Timeless Treasure Thrift Store: With a variety of donated goods for sale, you can find almost anything at the Cushing Thrift Shop at low, low prices! Our student workers will be happy to assist you. 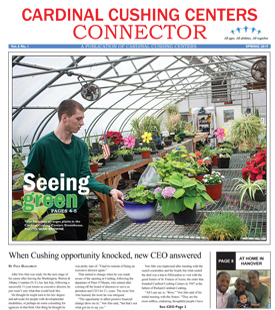 The Cushing Greenery: If you enjoy fresh flowers and locally grown vegetables,stop by the Cushing Greenhouse. Students care for the plants during the school year and summer. Please keep the Greenhouse in mind this holiday season for decor- fresh pine wreaths and trees will be available. Bass Village Cafe & Bakery: Looking for a warm cup of coffee or an afternoon cookie indulgence? With plenty of parking, and the friendly service provided by Cushing Center students and staff, there’s no better place to go to satisfy your sweet tooth. The Bass Cafe also offers fresh soup and made-to-order-sandwiches for lunch.You can grab-and-go, or sit and stay for a while! Iron Kettle: A true restaurant experience ,join us on Thursdays & Fridays for a hot lunch at the Iron Kettle. A great spot on Route 53 where you can enjoy a warm meal for under $5.00,our student servers are ready to welcome you at 12:45pm. Recycle Center: Fast and convenient,our students will help you redeem your recycled bottles for cash.